The Hong Kong International airport HKG is home to the world’s busiest cargo gateway airport. In 2015, HKG moved over 4.38 million metric tonnes of air cargo. It is also one of the world’s business passenger airports accommodating over 68 million passengers that same year. Operations at the world’s busiest cargo airport run 24/7/365 without stopping. Maintenance crews need a crack and joint repair material that can be applied in a wide range of conditions and be ready for service in minutes. 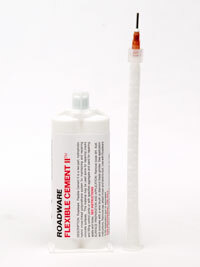 Roadware Flexible Cement II is a tough polyurethane crack repair material that can be applied at any ambient temperature. It bonds very well to distressed concrete and forms a tough semi-elastic polymer that will withstand heavy airline traffic in about 15 minutes. 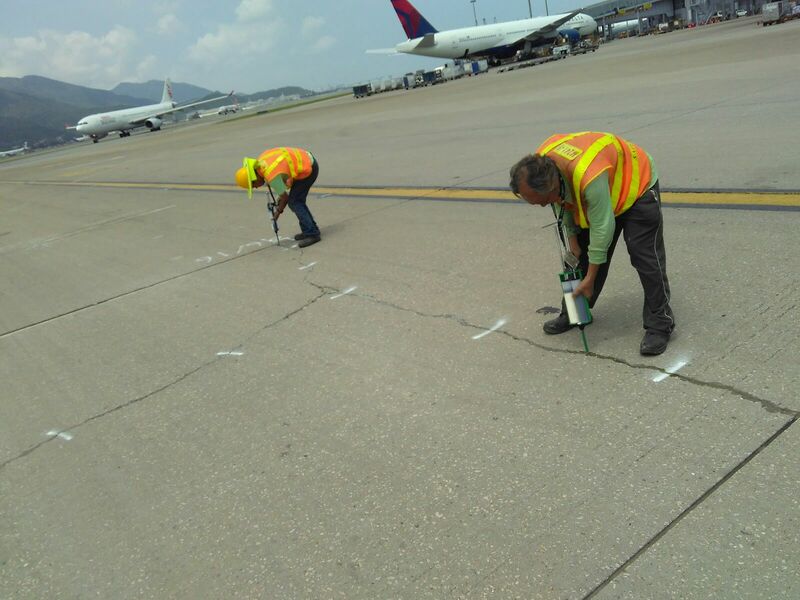 Crews at HKG airport have relied on Roadware Flexible Cement II to make repairs whenever and wherever needed for over 5 years. 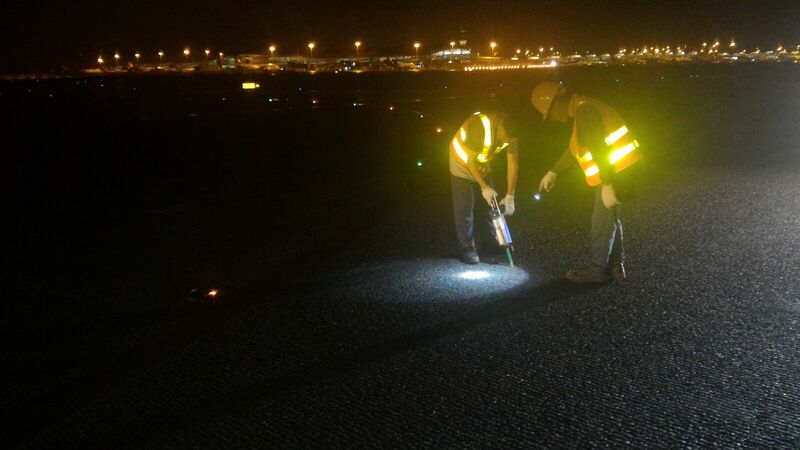 Maintenance workers repair a taxiway at night with Roadware Flexible Cement II. 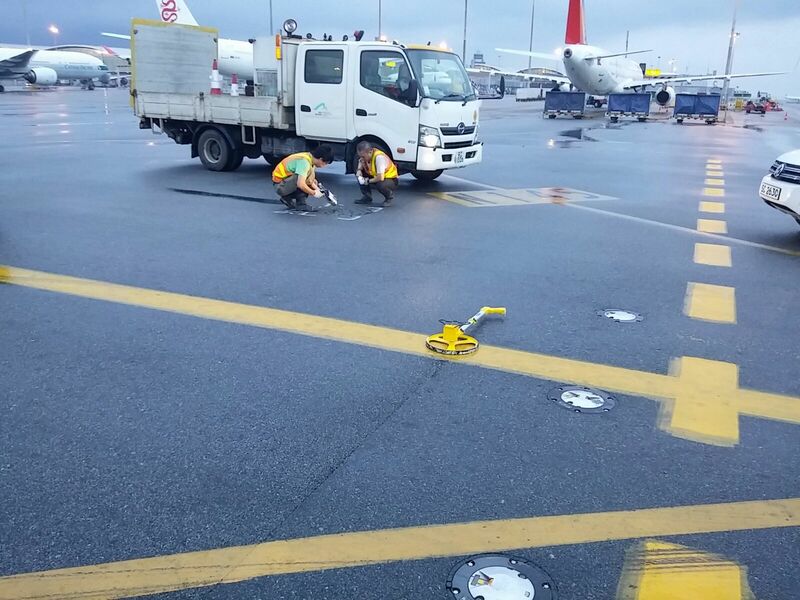 Crews use Roadware Flexible Cement II in 600ml cartridges to quickly repair concrete cracks in a taxiway at HKG airport. HKG crews use Flexible Cement II to seal cracks damp conditions. All about Roadware Flexible Cement II™. Roadware Flexible Cement II™ is semi-ridged polyurethane for creating flexible bonds between concrete surfaces and other materials. This versatile material may also be used to protect contraction joints from traffic deterioration. Origin: Designed for creating flexible bonds between concrete surfaces and dis-similur materials. Function: To flow into concrete cracks and joints. Filling the void with a semi-flexible polyurethane the will accommodate heavy traffic. Civilian Use: Fill cracks, joints and spalls in commercial, industrial and civil applications. Use Flexible Cement II™to repair cracks and protect control joints in parking structures, bridge decks, loading docks, and many types of structural concrete. Use on industrial floors to protect saw-cut control joints from wheel traffic damage. Use Flexible Cement II™ to seal cove joints where the floor meets a structural wall. Seal electrical loops and embedded lighting systems. Repair concrete thresholds with high thermal differentials. Flexible Cement II™ is tolerant of surface moisture when applied. Concrete should be as dry as practical to insure a good bond. Flexible Cement II™ is an excellent flexible adhesive for bonding metal, wood, and synthetic materials to concrete. Use to bond moldings and tack strips to concrete floors. Bond carpet nail strips to concrete. Bond carpet molding to concrete. Repairs are tough and can handle heavy industrial traffic. Use Flexible Cement II™ to protect joints and cracks in concrete bridge decks and pavement where heavy traffic is anticipated. This polyurethane is about as hard as a roller blade wheel and will prevent debris from filling cracks and causing further deterioration of the concrete. Flexible Cement II™ is recommended for low movement crack repair. 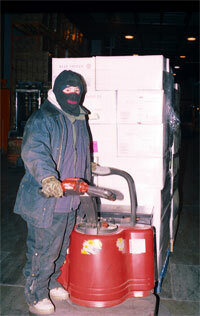 This tough material will hold up to forklift and industrial traffic while allowing for some movement. For high movement areas and expansion joints, we recommend a softer caulk type material. Flexible Cement II™ repairs are ready for traffic in just 10 minute at 75 degrees F (24C). The passenger tram at this airport gilds on pillows of air. Flexible Cement II is used to prevent the expansion joints from damaging the air pillows. One of the 12 air pillows that support each car. Flexible Cement II™ prevents metal expansion joints from lifting up and cutting the air pillow as the car passes. Flexible Cement II™ is used to protect the interface between the metal expansion joint and the concrete. This allows for a smooth surface for the air lift cars to glide over. Hereʼs one you can warm up to. While installing 14 cases of Roadware Flexible Cement II (thatʼs 168 tubes), Roadware contractor Dave Wilson got tired of shaking and turning tubes, waiting for the ball bearings to start clicking. Dave headed over to a Super Wal-Mart looking for an electric blanket. It was the wrong time of the year, but they did have heating pads. Dave had this crazy idea if they warmed up the cartridges, the material would mix immediately, speeding up the installation and keeping the installation virtually striation clear. To make a long story short, he got that and a whole lot more. The heating pads exactly fit the boxes of Flexible Cement II™..
Open the bottom of the box, remove the bubble packing and insert a heating pad. Open the top and place an additional heating pad on top of the cartridges. Turn the pads on to medium/medium high. Take out a layer of cartridges (3) and place the pad on the next layer. Shake the three cartridges until the white side has a consistent color. You will hear the steel ball rattle inside. Set up the three cartridges and run out 10-15 feet of expansion joint or construction joint with FLEX II. Have second crew member follow behind with a second application and a third crew member follow with a third application. At the end of the third application leave the nozzle stuck in the joint to dam the warmed FLEX II. Set up three more cartridges and continue the run until complete. The warmed FLEX II will self level, require no additional trowel work and if done carefully, no clean-up needed. Pull the nozzle-dam and replace it with FLEX II as you start the next run. This will eliminate cold joints. When breaking for lunch, reduce pad heat to medium. Electric heating pads are a good way to warm up Flexible Cement II prior to application. Use caution not to “cook” your cartridges for more than 12 hours. Leaking at the seals may be the result. Freezer threshold repair with Roadware 10 Minute Concrete Mender™. Freezer, chiller and cooler thresholds have been an ongoing challenge to floor repair contractors and the USDA since the 1950’s. Recognizing the need to keep refrigerated and frozen food storage areas clean and sealed so they will not harbor lichen, fungus and pests, the USDA has issued zero tolerance guidelines for floor cracks and spalls in all food processing and refrigerated food lockers. Unsealed and opened joints also come under the watchful eye of those charged with keeping America’s food supply safe. Because thresholds are freezing cold on one side and at room temperature on the other, the thermal stress on the concrete is unrelenting and unforgiving. Couple this with forklift and wheeled cart traffic and you have a formula for disaster. Fortunately, 10 Minute Concrete Mender™ has become the accepted repair material for these very harsh conditions. The agency itself is forbidden from recommending one product over another, but the personal choice among active USDA inspectors is Roadware 10 Minute Concrete Mender™. It’s thin, it gets in, it won’t pop out. Some minimal prep work is required when working in the cold. Have the cracks and spalls as clean and dry as possible. This may not be easy, but it’s a step professionals know better than to ignore. Next, apply Mender to the base and sidewalls to seal off any free moisture movement into the repair area. Immediately follow by filling the spalled area or crack, almost to the top, with manufactured sand or approved quartz. Flood the sand to refusal, making sure the Mender saturates each grain. For larger areas, a bulk mixed mortar of Mender and sand may be easier to handle and install. Keep all materials at room temperature or warmer to speed up cure time. Even then, one should plan on an hour or more if temperatures are extreme. However, since all conditions vary, onsite testing is the best way to insure the time at which freezer floors and thresholds will be traffic-ready. Contractor field reports are very solid in reporting that 10 Minute Concrete Mender is the only thing that works in these tough repair situations. Click here for step by step bulk application instructions. 1. Remove existing concrete to wood base. with Roadware Flexible Cement II™. 5. Reopen to traffic when Flexible Cement II is fully cured. Repairing Railings and Posts with 10 Minute Concrete Mender™. How often have you run into this problem? Industrial railings that have been split apart due to age, abuse, or weather damage. With a few special techniques, you can repair these problems with Roadware 10 Minute Concrete Mender™. Clean the repair area with a wire brush or by sandblasting. Remove as much of the rust as possible. It is also a good idea to spray the the steel railing with a rust neutralizer. Make a simple form out of blue foam board, and duct tape or most anything plastic. Do not use wood, Concrete Mender will permanently bond the wood to your railing base.I made that mistake years ago and had to chip, grind and sand the wood off the face of the concrete. 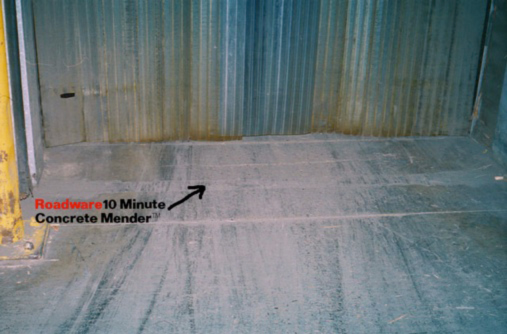 Make your repair by pouring 10 Minute Concrete Mender™ bulk mixed with sand in from the top. Allow to cure and finish the surface with a stone or grinder. Add a quick coating of a latex cement coating and your finished. You may also make repairs around railings with Roadware Flexible Cement II™ if the railing is made aluminum and requires more thermal contraction and expansion properties. Airport terminal deck repair after 5 years. 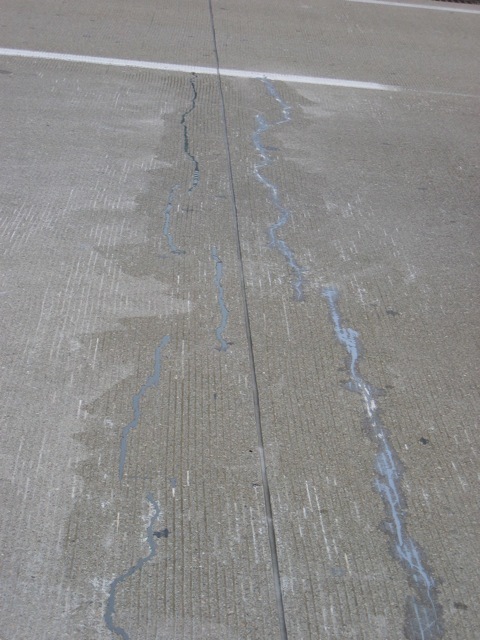 Here is a crack repair project at the CVG Airport in Cincinnati, Ohio. The upper terminal deck developed cracks parallel to the construction joints. 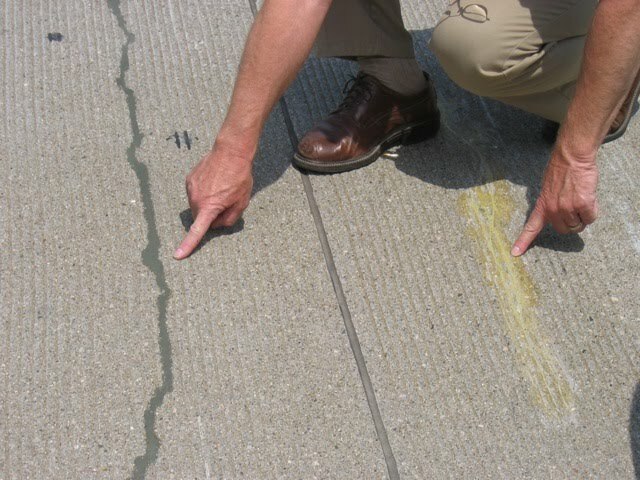 Roadware Flexible Cement II™ was used to repair the cracks in 2005. Here are some pictures of the project over the years. 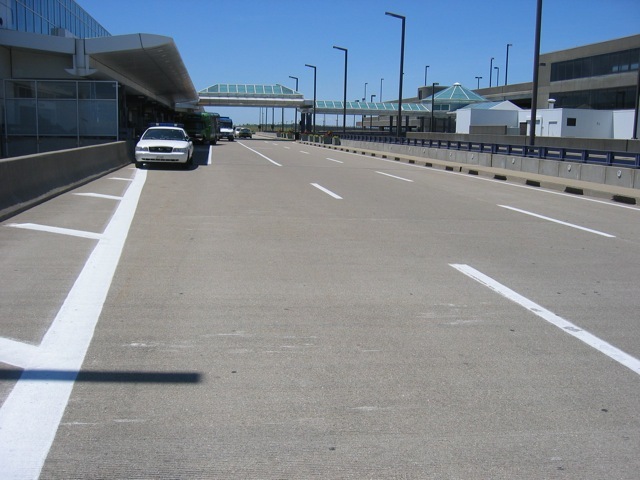 Here is a photo of the CVG terminal deck as of June 2010. 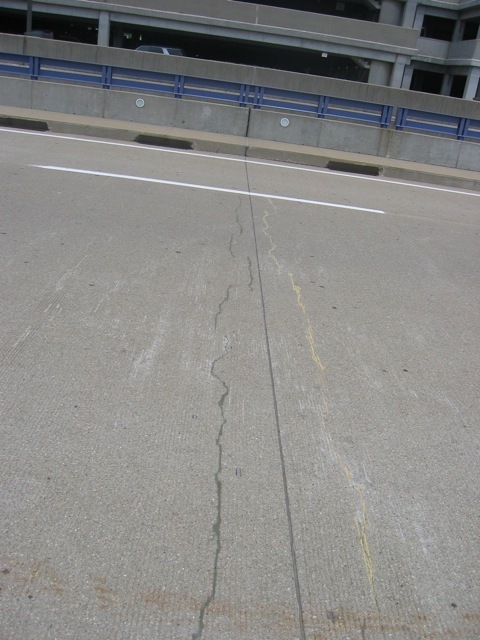 Roadware Flexible Cement II™ was used the repair the crack on the right in 2005. 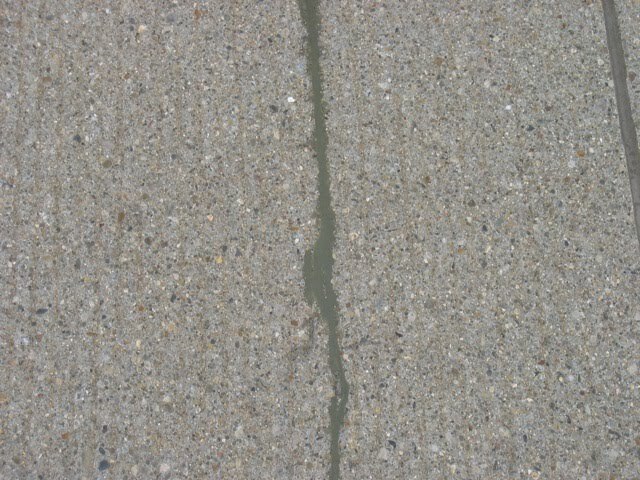 The crack on the left was repaired with Roadware 10 Minute Concrete Mender™ for comparison. Finished repairs in 2005. Roadware Flexible Cement II™ on the left. Roadware 10 Minute Concrete Mender™ on the right. Repairs as they appeared in 2006 after one year on service. Both are holding well. The Roadware 10 Minute Concrete Mender™ on the right shows yellowing, but is still performing well. The Flexible Cement II™ is slightly lighter on color, but looks perfect. Here is the same repair in June 2010. After 5 years on service, everything looks good. This is a close-up shot of the Flexible Cement II™ after 5 years of service. The repair is still holding like the day it was installed. 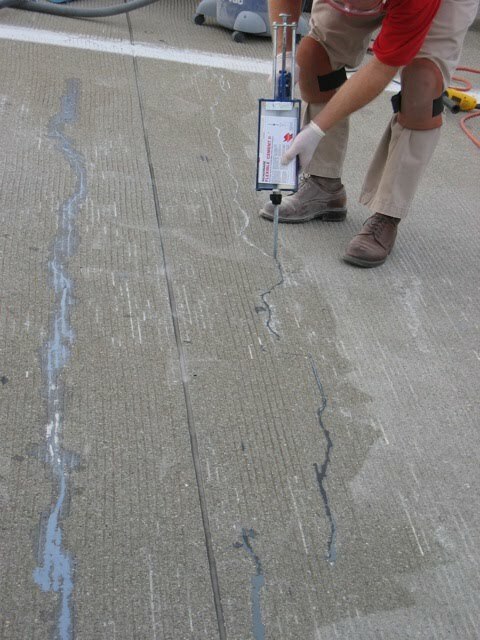 Roadware Flexible Cement II™ is a good choice for outdoor repairs in structural concrete. The semi-flexible properties strike a good balance between road toughness and just the right amount movement absorption.